Slept in this morning, and felt mostly justified because of my incredibly long day yesterday. I had a lovely slow breakfast in the hostel, then packed my lunch and set out. Since roman times, Girona has been surrounded on three sides by a wall, and on the fourth by the river, and the wall has been beautifully restored and edited to allow for the passage of cars and pedestrians. The wall is massive, not, of course, as thick or as huge as the walls around Ávila, but easily four stories high and two or three meters thick, with five 14th-century towers at regular intervals. It’s easy to get to the top of the wall, so I walked the circumference of the city and enjoyed spectacular views of the mountains to the west. I was pretty hot after my walk, so I followed the palm-bearing locals into the cathedral and listened to the mass (in Catalan! It’s a lot more like French than Spanish) in the cool of the nave. The cathedral here is built like a fortress, and I am amazed that the walls support the weight of the roof, as the building is 23 meters at its widest point, the widest in Europe. It’s very impressive, and of course the cool of a granite building is always welcome, especially if it comes with pipe organ and lovely singing. 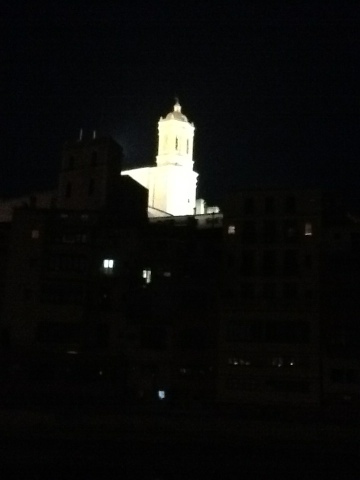 A blurry night photo of the cathedral from below. I got chilly, and wandered outside to eat my lunch on the steps of the cathedral. I have been rejoicing in my return to a country with baguettes–Hungarian bread is fine, but it’s got nothing on the slightly sour tang and crunch of a real baguette– and my lunch for the past two days has been bread with aged sheep cheese and chorizo slices. It reminds me of the last time we were in Spain, and how we used to by Iberian ham and fancy cheese for lunch every day. I never did get sick of it. After my lunch, I meandered down the hill, towel and swimsuit in hand, planning on visiting the ‘Arab Baths’ for a swim. Hungary has spoiled me, of course. I expected a real bath, and found instead a 12th century ruin and archeological site! It was very interesting, but I really prefer the kind of baths that you can swim in. Disappointed, I turned away from town and started walking up the Sant Daniel Valley, following a little creek out of town. I passed a Benedictine monestary, went through a small neighborhood of orange houses, and out into the countryside, where the hayfields are coming up a Kelly green so bright it hurt my eyes, especially after the comparative brownness of Hungary. I hiked up into the nature park, following the trail to a few really lovely springs tucked into the woods, and then climbing a hill that gave a spectacular view of the valley with the cathedral visible in the distance. I even met some nice Irish people (who were, I’m almost certain, speaking Gaelic to each other–that, or Irish accents are more impenetrable than I remember) and hiked with them a while. I must have walked for several miles because my feet are quite sore. It was by now mid afternoon so I headed into the old part of Girona and explored the narrow maze of the Jewish quarter. The whole of the old town reminds me of some of the cities in northern Italy, especially San Gimignano and Siena, with cobbled streets no wider than my arms’ length and tall buildings reaching up five or six stories. It’s very dark and cool down at the bottom of those ravines, and the blazing sunshine of a sudden open square is welcome. I had dinner on the more modern side of the river (with a bottle of lemon Fanta. Does it really taste better in Europe or am I just pretentious?) and then walked back to the hostel via a creperie that sold me a crepe filled with dulce. Actually I completely forgot that dulce del leche exists until I saw it on the menu, but a jar of it is definitely coming back to Hungary with me. So delicious. Now I am hanging out in the common room, watching Villareal and Espanyol kicking a football around to no great effect. The score has been 0-0 for a while now. TL;DR: Ariana pretends to be a heroine in a Victorian novel, ie traipsing around in warmer climes and being charmed by local color. Off to Barcelona tomorrow! You certainly walked a lot on your restful day! Where did you find the nettles? I hope that you buy a pretty skirt somewhere in Spain if the weather is summery. Thank you for giving us such detailed word pictures of your day! The nettles were next to one of the springs. I saw them but didn’t register them as tiny pain-injecting hairy vegetables until it was too late. Thankfully, I knew not to itch it so the stinging went away after a couple minutes. I still have trouble imagining picking nettles early in the spring and cooking with them. Maybe in Spain it’s well past early spring? If they stung you, I guess that they are no longer edible. I’m having a great time following you on Panoramio and google maps. Thanks for all your posts. I thought the story about the Arab baths was hilarious. Sad story about the baths but Spain is sounding awesome! I’m glad you’re so flexible with what you do/ where you go/ who you hang out with. Also try to watch Game of Thrones season 2 AS SOON AS POSSIBLE because ohmygosh it’s amazing!